The Notre Dame Cathedral in Paris, France, continues to burn this evening in the City of Lights. The fire broke out around 6:50 p.m. local time near the roof and quickly spread. Notre Dame was not only a significant Catholic house of worship but also a magnificent architectural marvel visited by millions worldwide every year. It also housed invaluable artworks and artifacts. The cathedral was built in the 12th and 13th century. The cause is not yet known, but the Paris fire brigade says it is "potentially linked" to a €6 million renovation project. Heavy flames engulfed the wooden church. The spire and roof collapsed and firefighters had trouble bringing it under control. Only one firefighter was seriously injured. No one was killed. No word on the extent of the damage or the loss of artwork. Parisians took to the streets to sing hymns and recite prayers as the building smoldered. Officials say that the main structure has been saved. "Throughout the day, I've monitored news reports regarding the fire overwhelming the Cathedral of Notre-Dame de Paris with deep sadness and shock. For over 800 years, Notre-Dame has been one of the most iconic churches in Christendom - a testament to man's desire to glorify God on earth and a beacon of hope for millions of pilgrims each year. The ongoing destruction being wrought by flames is doubly sorrowful as it comes during the holiest week of the Christian calendar. I ask the clergy, religious, and lay faithful of the Archdiocese of Philadelphia to join me in prayer to the Blessed Mother for the protection of fire personnel and first responders in Paris working to battle the blaze and provide for the safety of the community. We also pray that our Lord will bring comfort and peace to Archbishop Michael Aupetit as well as our brothers and sisters in the Archdiocese of Paris, and the people of France at this time. In the face of desolation and devastation, we find hope in the Resurrection." *earlier headline mischaracterized total damage as "burned to ground." 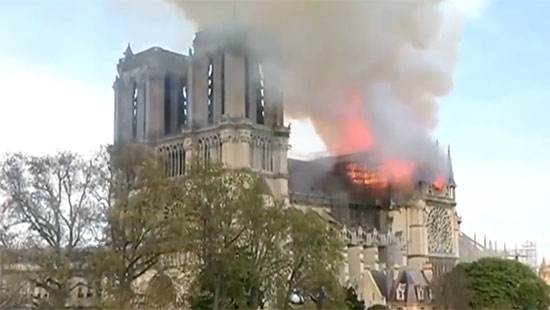 The majority of the wooden structure of the Cathedral has been destroyed. The stone structures have been saved. It is still burning. The fate of anything inside is unknown.